Whole Foods Market (NASDAQ: WFM) announced in May of last year that it was working on a new concept store design, one with convenience, price, and technology in mind. The new locations, called 365 by Whole Foods Market, have been talked about as the savior to Whole Foods' declining margins and traffic, as well as a way to attract younger consumers with cheaper prices and a focus on more than just groceries. One year later, the first 365 store is finally about to open on May 25 in Los Angeles. Here's what to watch with the store opening as well as the new concept's success. Whole Foods has started to let various media outlets in to see what the new store will look like. 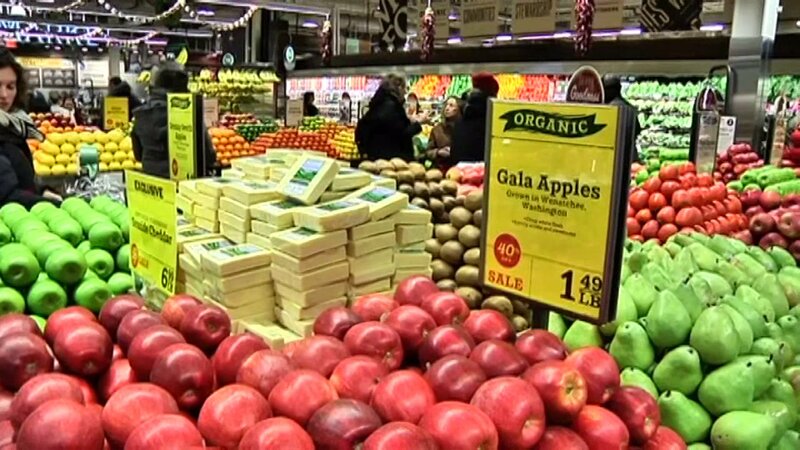 As reported by The New York Times, the store includes vibrant primary colors, more natural displays with produce kept in its original crates instead of stacked in neat pyramids, and an exposed industrial-looking interior with low-profile lighting fixtures and smaller shelves. There is a mixture of technology with self-checkout terminals and robotic tea-serving kiosks. The store is smaller than most parent stores and will stock many fewer brand options -- offering mostly the company's 365 brand, which is generally cheaper than other name brands. The idea is simpler shopping, and lower prices. But it's also meant to be a new shopping experience. The new stores will feature space for other businesses to offer products and services to shoppers, which according to their website at 365byWFM.com could include more than just food products, such as "fashion, body care products, services, and more"; each store will have a different mix based on local partners. The 365 stores will also feature a loyalty program; the 365 Rewards program will include "personalized nutrition insights, savings, special offers, perks, and more." After this store in LA opens on May 25, Whole Foods has announced that the next locations to open will be in Oregon in July, and then in Washington state in September. Altogether, Whole Foods has 19 leases signed across the country for creating 365 stores, including a couple that will be conversions from Whole Foods Markets into the 365 store format. Whole Foods has had a tough time in recent years as larger competitors have seen its success with selling organic and natural food, and have started to compete in that niche with lower prices. The success of those competitors, like The Kroger Co.(NYSE: KR), which is now the largest seller of organic and natural foods with its Simple Truth line, has been blamed for Whole Foods' declining same-store sales and decreased margins. In the most recent quarter, Whole Foods posted net income down from a year ago, following gross margin that has been gradually falling over the past few years. In this most recent quarter, gross margin was down 103 basis points to 34.9%. Same-store comps came in at negative 3% year over year, which constitutes the third straight quarter of declining same-store sales. However, these 365 concept stores seem to be an option for Whole Foods to start being more competitive in a now crowded space. The refreshing concept could help to drive new interest, and lower prices for consumers could drive more overall sales. But especially helpful for Whole Foods' bottom line is that these stores will have lower operating costs. Everything about these 365 stores is meant to be simpler, which should help Whole Foods to cut costs. Each store will be smaller than parent stores, which will mean less spent on leases and other land operating costs. Because the stores are more of a standard design, they can be developed with less cost compared to the unique design of many parent stores, and Whole Foods can also get them up and running faster. The stores are planned to have just around 100 employees who are all cross-trained for various roles, as opposed to parent stores that have 250 to 500 employees. They will be helped by tech upgrades like electronic checkouts, and a dedicated smartphone app about wine that customers can use instead of consulting a sommelier on staff. Even the way food is presented will help to lower costs by getting rid of expensive displays and packaging. Prices for items will be on digital displays, which will allow prices to be quickly changed without the cost of changing displays. Because most of these items will be Whole Foods' private-label 365 brand, they stand to have better margins on decreased sourcing costs as well. As with any new product or concept, we'll have to wait to see how local markets receive this new concept store, and how effective the company will be at expanding that model further. It will take time for this plan to work out, as even when 365 stores are built on these 19 leases, they will still account for less than 5% of the total number of Whole Foods locations. However, the plan for these new stores looks like a solid one both for the consumer and Whole Foods, and could certainly be the start of a long-term turnaround for the company and its stock. John Mackey, co-CEO of Whole Foods Market, is a member of The Motley Fool's board of directors. The Motley Fool owns shares of and recommends Whole Foods Market, and has a disclosure policy.